Luke brings you today an update on our thriving children's art program. Our art program attendance has nearly tripled since Zoë, Sam, and I took over the class in late August. This is largely due to our push to advertise our art program within the library space. The biggest promotion has come in the form of our monthly library parties, where we host a craft hour within the library open to all children who are interested in participating. Our children’s art program serves as a creative outlet for the children that frequent our library, and has quickly become one of my favorite programs that we run here in Ecuador. As a supplement to the Ecuadorian school system in the way of creative thinking, I believe this program is extremely important. And let’s be honest, it’s fun to spark the artistic bug in children which often times results in them getting paint and glue all over themselves. As well as stimulating creative thinking, another goal of our art program is to increase cultural awareness through focusing on art projects from around the world. Each art class is preceded by a brief charla on the cultural region, art, or ethnic group that we have chosen to focus on. Thus far we have focused on Native American art, where we did numerous projects including the construction of tipis; Asian art where we made origami frogs – they could actually hop! – Middle Eastern art where we made pyramids out of caramel, which later melted in the sun (bummer); and our current focus of South American art, where we are emulating art projects from famous South American artists. 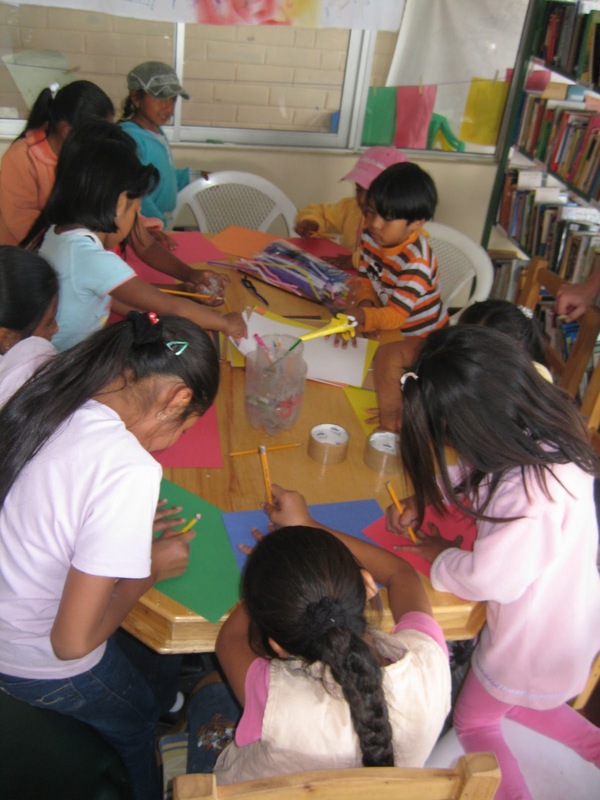 Our children’s art program serves as a learning tool, a vehicle which inspires creativity, and a fun class that creates a light atmosphere for children from different neighborhoods to enjoy each others company. Exciting news readers! While talking to a few Program Directors we came up with the brilliant (if I do say so myself) idea of doing a blog swap. Manna Project is an international organization with two other sites, one in Guatemala and one in Nicaragua. Guatemala's site was started just 7 months ago and we here in Ecuador wanted to share a little about what they have been doing since their founding. Hope you enjoy! 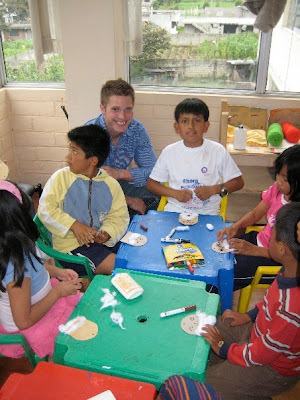 My name´s Hudson and I man the blog up in Guatemala for our newest MPI site. Hannah´s writing a post for us this week about the amazing work her team´s done in Ecuador this year and she invited me to share an update on how we’ve filled our time since we started in July. to introduce us to the community. A month later, we were assembling furniture between hurried meetings about our first classes. A local elementary school had invited us to teach fourth through sixth grade English, and we were overwhelmed in equal parts with excitement and apprehension. The classes were a huge success. 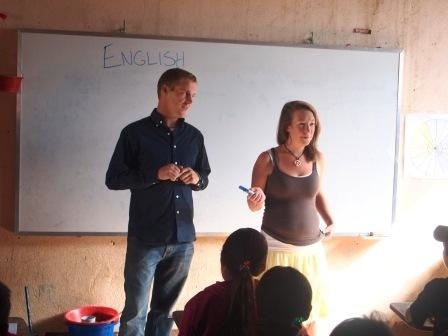 Jared and Ginny teaching English classes! Through the school we were able to secure relationships with the teachers and gain valuable confianza in the community. We learned that the kids had no constructive opportunities in the summer (October – January), and started an education camp to help meet this need. Over 120 children attended. 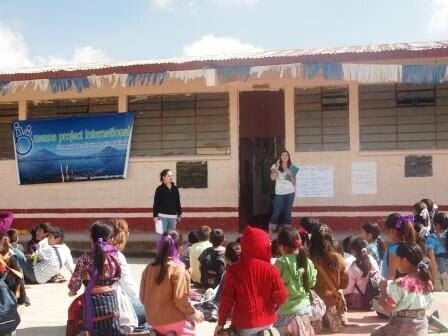 Kat and Dana (Country Directors) give a charla to the kids. At the same time, we laid the groundwork for a community recycling program that will eventually turn plastic bottles and chip wrappers into the bricks for a new addition to the school. Then Christmas came, and we stopped to catch our breath. Our first forays had served over 150 students and given us valuable time to become friends with community leaders and learn where else we could help. Then it was back to work. We launched a student health program focusing on clean habits and reproductive education. On the English side, we revamped our curriculum so it was written entirely in Spanish, allowing us lesson plan with each grade´s teacher. That means next year they´ll already have the lessons and the curriculum – a key first step in moving towards long-term sustainability. We also expanded our English classes to a second elementary school. 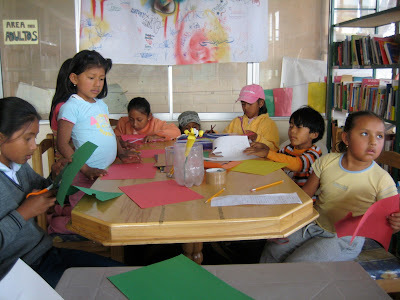 There, we have a teacher´s English class and offer an after school program for interested fifth and sixth graders. Plans are also in the works to start a small business program, to sell Mayan products back at Vanderbilt, and to introduce a women´s exercise class. Overall, the pace has been daunting and the progress consistent and rewarding. We´ve hit dozens of roadblocks and reevaluated our expectations and programs at a couple junctures, but we feel we´re proving that Manna is an organization worthy of trust, one with the community´s best interests at heart. We look forward to further growth and future progress, and we´re proud to have been able to draw on the insights and models from Ecuador and Nicaragua. If you´re ever in Guatemala, we´d love for you to drop in to see where we work, and until then, drop by the MPI Guatemala blog for weekly updates. One of the pillars of MPI Ecuador is to strengthen institutions and build networks between community members as well as institutions. In the agriculture program we have focused on these goals by partnering with a local organization that supports organic farming in the community: Fundación Añamisi. Luke and I have gone to help out in Añamisi’s garden most Friday mornings since last September. In addition to their organic garden, Añamisi has also recently opened a small organic tienda, or store, where they sell some produce and other organic products. It has been very cool to see Añamisi grow as an organization as they begin reaching out to the community with their new business. 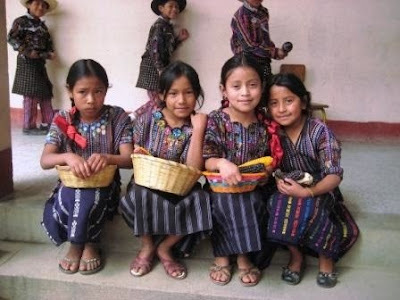 We have also stumbled upon another cool way to not only help Añamisi reach out to the community but also to connect them with Esperanza y Progreso del Valle (EPV), our partner organization in business development (formerly known as our microfinance program – more on that change soon). EPV has found that some of their clients taking agricultural loans are having trouble paying them back. A big reason for this is because their clients are seeing a smaller production from their land due to bad farming practices. At the end of this month EPV is hoping that Añamisi will start having charlas (or educational talks) for some of their clients and some potential clients to teach them how to farm sustainably. We are really excited to see Añamisi start working with another business in Rumiloma and extend their reach into the community. Last week we were able to bring our 6th grade nutrition class students from Fundación Aliñambi to Añamisi. It was a lot of fun having the kids ask Christian and Laura, the heads of Añamisi, questions about organic framing and have them see Añamisi’s garden. The class went great; not only did Christian and Laura, who also helped a great deal with our summer camp back in August, enjoy teaching the kids, but the kids loved being able to go on a field trip to a local garden, even though it was just a few blocks down the street. Christian and Laura explaining how oregano protects these chard plants from insects. Learning about why corn is planted in successive rows: "It's like the tall ones are the younger ones' older siblings, just like your older brothers and sisters!" With our new Wednesday-Saturday schedule, adult English has been drawing from an entirely new subsection of the community. Those who couldn’t make our previous 5-7pm weekday classes due to work are now able to attend our 6-7pm Wednesday and 9-12 Saturday morning classes. It’s been really exciting to see new faces! Separating the class into three levels required the further adjustment of splitting up Brock and Sam’s prior teaching team. 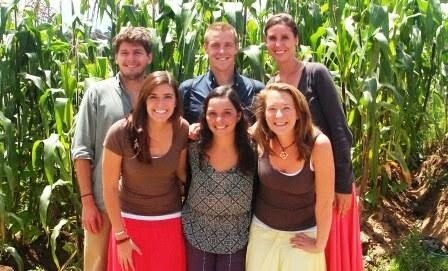 In the fall, I taught my own basic English class, and Brock and Sam taught the intermediate English class together. This time around Brock has taken the basic class, Sam the intermediate class, and I the advanced class. So far, I personally have loved the change. My class of 12 ranges from 14-year-old Jonathan, looking to supplement his high school English curriculum, to several middle-aged folks who want to improve their English in order to become more versatile in their lines of work. During our Wednesday hour, I introduce the basic concepts of the chapter we’re working on that week (they are able to move much faster than my basic class did), give them homework, and then we review the concepts in depth through homework review, more exercises, reading comprehension, and games during our longer Saturday morning class. With this setup, we encourage students to come to all classes, but if they can’t come to the Wednesday class due to work, they don’t actually miss out on entire portions of the material. Two of my students, Ana and Franklin, are cousins; Franklin is only available for the Saturday morning class, and Ana is only available for the Wednesday afternoon class. Ana told me yesterday that between each class they fill each other in on what the other missed and thus cover both the introduction and the in depth coverage of the material. It works for everyone! A final change that’s affected the way we operate adult English is that all three of our levels take place at exactly the same time, whereas previously the basic class ran Mon/Wed and the intermediate class ran Tues/Thurs. Now all three of us occupy spaces in the library from 6-7pm Wednesdays and 9-12pm Saturdays. Since my class is the biggest, I have remained at the big English table outside the teen center, while Brock teaches his basic class in the children’s art corner and Sam alternates between upstairs in the women’s exercise space and the table in the adult section of the library (since the upstairs space is occupied by women’s exercise and cooking classes on Saturday morning now). Brock's basic class in the children's art corner. Sam's intermediate class in the women's exercise space. My advanced class, sans a few students. Thank goodness we have three dry erase boards and markers are cheap! With an update on continuing developments in Microfinance, here's Jack! Just before Christmas break, we wrapped up MPI Ecuador’s first small business course. Our final class will stand out as one of my favorite moments of the past 7 months. Each of the students shared their feelings as entrepreneurs and how intimately proud they have been of their work of running their own businesses. Even better, our students discussed in detail how our course motivated them to make some concrete improvements to their businesses. The final moments of this class gave me a convicting reaffirmation of the MPI’s capacity to truly empower others. Several weeks ago, we brought on a fantastic new addition to the MPI team: Carlos Rodriguez, a finance student from Quito, is now helping out at our centro and is helping us start an exciting new element of our Business Development program. Together, Carlos and I are now providing consulting services to several businesses in our area. This past Saturday we worked with our first two clients. We started in Sangolquí working with a small business that sells feed and other supplies for livestock and pets. This family-owned business demonstrated to us that they have had no shortage of clientele, but they have been struggling to make income cover their costs. Carlos and I are currently in the process of helping them re-organize their inventory system so they can get a better grasp of their daily and monthly finances. After some time in Sangolquí we went back to Rumiloma to work with a small group of women who manage their own street-food stand. Every Saturday, these women sell plates of barbeque chicken and roasted potatoes. We made a brief summary of their finances, and discovered that despite their hard work, their chicken dishes have been too costly to turn a profit. After comparing their expenses from cooking up barbeque chicken with what they would be earning if they switched to salchipapas (french fries and hot dogs, an extremely common street-food option), they would be making significantly more money. These women were excited, albeit flabbergasted, about the prospect of finally making some money on their Saturday afternoons. With a stimulating and successful day behind us, Carlos and I are thrilled with the potential impact we can have by personally working with businesses in the area. It’s amazing what a calculator and some common sense can do to completely jump-start someone’s livelihood.